The module reviews the fundamental steps for writing a Terminal Aerodrome Forecast (TAF) using guidelines and recommendations developed by the World Meteorological Organization (WMO) and the International Civil Aviation Organization (ICAO). This module outlines effective forecast methodologies to develop TAFs that represent the expected conditions that aviation customers can use to make operational decisions and minimize unnecessary costs. 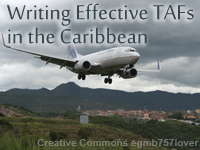 The module walks users through the process of analysis of satellite, surface, and observational data to create a TAF forecast for an airport in the Caribbean. It feels like the person who wrote this "lesson" has never written TAF's operationally. Develop skills in writing an effective “practical” TAF that provides an improved forecast of expected flight category changes, while maintaining a customer-friendly format.